People may know few things about COB LED display, but probably didn’t hear the new pixel protection technology, GOB LED display. Let’s introduce for you now. 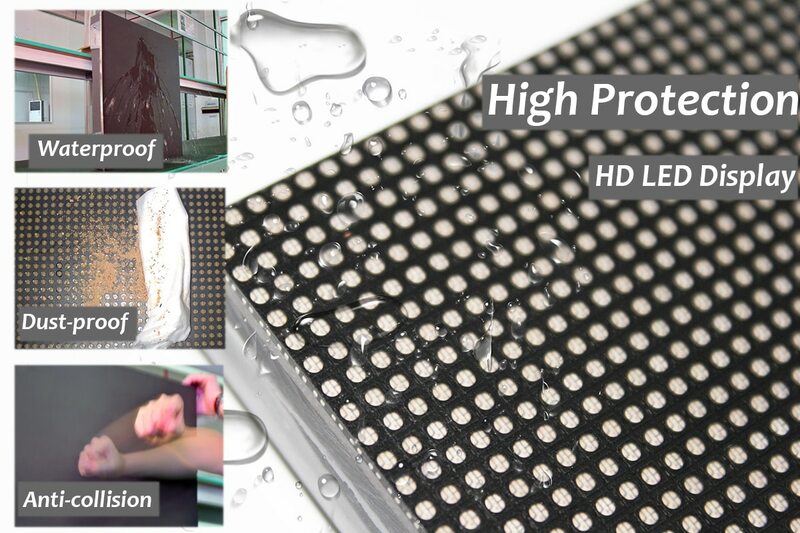 GOB is Glue on board to get high protection led display, which is new technology, an analogy as module encapsulation. It is working on the whole display module, e.g. 250*250mm, by using a patented transparent glue covering the surface of module’s PCB board already with thousands SMD lamps soldered on it, finally the module getting the special shield on its surface. It comes out a high protection led display capable for anti-collision (anti-bump), dust-proof, waterproof, anti-moisture, anti-UV, along with no harmful impact for heat dissipation and brightness loss. The long time strict test clarified that the shield-glue even contributes the heat dissipation, extending the life span. The revolution change to push the whole led display industry is that this GOB display is aimed for the fine pitch led display and rental screens, which have natural demands for led diodes protection. What’s COB LED display technology? COB is Chip on board, which is a different chip encapsulation technology, all chips directly integrated packaged on the special PCB board, while what we said encapsulation tech is putting three RGB led chips to integrate inside an SMD electronics package to produce the individual SMD diodes. COB literally sounds similar to the GOB display technology, but it has longer developing history, and recently has been adopted in some main manufacturers’ promoted products.. Earlier at ISE 2017, SiliconCore published its 1.9mm COB led display. At ISE 2018,Daktronics, Absen, Ledman, Changchun Cedar and Deepsky issue their COB fine pitch display and rental series. Wide viewing angle, high color uniformity, high contrast,high power efficiency, etc, are the cliches features same with traditional led technology. The biggest thing is using COB to get high protection performance like collision avoidance ,moisture proof and dust proof,in short, higher environmental adaptability. 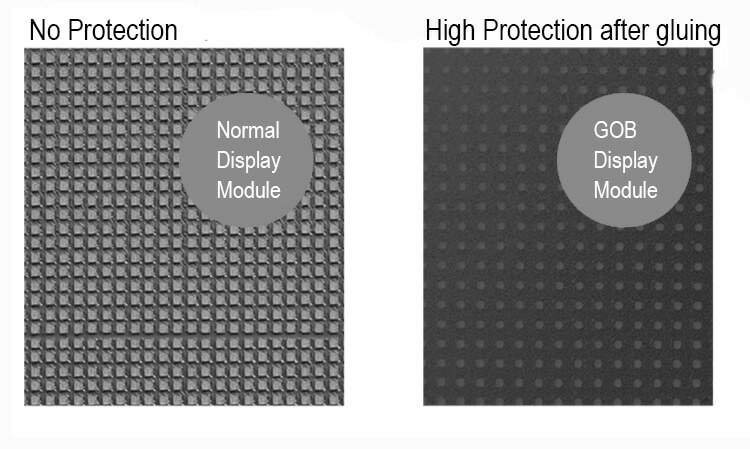 Absen called this NanoShiled coating technology to get pixel level protection. Obviously, COB technology is also to get high protection display same with GOB. Besides the cost, COB has a risky during the process of wavelength and color splitting and picking for all chips on the boards, which make it difficult to get perfect color uniformity for whole display. But GOB can get good color uniformity as modules have been made and tested in traditional way same as normal modules before the special gluing. The maintenance for COB is also a problem waiting to be solved. The DEEPSKY called itself Delta-enhanced COB technology, which features high brightness for small pitch led display, 3 times higher than most high-resolution led display, as high as 3000Nits. It claims using micro-leds, by laying three discrete Red, Green and Blue monochrome micro-LEDs on board. Next let’s talk about real Mirco led. What’s the Mirco LED and Mini LED, and the difference between Micro LED and Mini LED ? Mirco LED is a miniaturized LED arrayed of microscopic LEDs, with the LED unit smaller than 100 micrometers. Each pixel is individually addressed and driven to emit light (self-emitting), just like OLED. Theoretically speaking, Mini LED is different things,that is a transitional technology between traditional LED and Micro LED. The Mini LED, also known as “sub-millimeter light emitting diode,” with a size of about 100 micrometer. Mirco LED, Mini LED, and COB are in fact the three main focuses at ISE 2018. Considered as next-generation display technology, Micro LED and Mini LED involve large number of manufacturers at home and abroad developing and expecting future market prospects. Nichia, the Japanese LED giant, announced that it has completed the development process of Mini LED, is sending the samples to clients, and will be ready to do mass production of related products by the end of the 2018. For Micro LED, Nichia reported that the development is still an on-going process. It is possible to produce a Micro LED sample, but it will still take time for commercial manufacturing, estimating that Micro LED production will be scheduled in 2022. GOB,COB are mainly used to form large format size HD indoor displays over 80inches, while the main application of Micro, Mini LED display is currently expected to be used less than 80 inches in consumer market, like smartphones, wearable handsets, virtual reality products, television,etc. 3CINNO as a leading solution-based large size led display manufacturer located in Shenzhen, the developing and manufacturing center of high end led displays. We devotes to using new technology to rich the display lines and giving more value to our clients to help them win big reputation. 3CINNO GOB technology based rental and small pitch led display series is delivering to our clients, and accepting new inquiries for special requirements for high protection display. A custom-solution-based LED display manufacturer as one of special Chinese LED display suppliers provides robust and creative products, timely and professional service as our industry-leading LED screen technologies and integrated LED solutions. Driven to be excellence to meet your standards and special requirements, 3CINNO provides a one-of-a-kind design for your rental and fixed installation including stores, events, and tours,etc. through our award-winning line of LED video walls and LED video screens. Working with engineers, designers, architects, and consultants, 3CINNO is eager and proud to develop custom LED solutions for every customer while also providing top-tier customer support service no matter how small the led display is. For more details on the complete line of 3CINNO LED video screens and video walls, please visit 3CINNO at led-display-manufacturer.com, find us on Youtube, Facebook, or LinkedIn, or get us through direct Email, inquiry@3cinno.com .